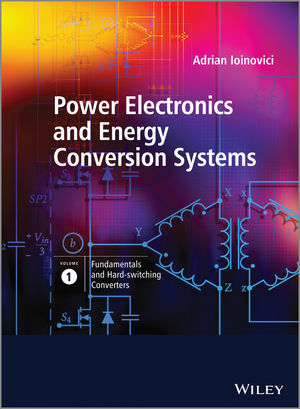 Power Electronics and Energy Conversion Systems is a definitive five-volume reference spanning classical theory through practical applications and consolidating the latest advancements in energy conversion technology. Comprehensive yet highly accessible, each volume is organised in a basic-to-sophisticated crescendo, providing a single-source reference for undergraduate and graduate students, researchers and designers. Volume 1 Fundamentals and Hard-switching Converters introduces the key challenges in power electronics from basic components to operation principles and presents classical hard- and soft-switching DC to DC converters, rectifiers and inverters. At a more advanced level, it provides comprehensive analysis of DC and AC models comparing the available approaches for their derivation and results. A full treatment of DC to DC hard-switching converters is given, from fundamentals to modern industrial solutions and practical engineering insight. The author elucidates various contradictions and misunderstandings in the literature, for example, in the treatment of the discontinuous conduction operation or in deriving AC small-signal models of converters. With emphasis on clear explanation, the text offers both a thorough understanding of DC to DC converters for undergraduate and graduate students in power electronics, and more detailed material suitable for researchers, designers and practising engineers working on the development and design of power electronics. This is an accessible reference for engineering and procurement managers from industries such as consumer electronics, integrated circuits, aerospace and renewable energy. Professor Adrian Ioinovici, Electrical and Electronics Engineering Department, Holon Institute of Technology, Israel Professor Adrian Ioinovici joined the Holon Institute of Technology in 1982; prior to this he was a Professor in the Electrical Engineering Department at Hong Kong Polytechnic University. He has been Chairman of the Technical Committee on Power Systems and Power Electronics of the IEEE Circuits and Systems Society. He has served as an Associate Editor of the IEEE Transactions on Circuits and Systems-I, and of the Journal of Circuits, Systems and Computers. He was co-chairman of the Tutorial Committee at ISCAs’06 and designed co-chair, Special Session Committee at ISCAS’10 in Paris. Professor Ioinovici is the author of the book Computer-Aided Analysis of Active Circuits (New York: Marcel Dekker, 1990) and of the chapter "Power Electronics" in the Encyclopedia of Physical Science and Technology (Acad. Press, 2001). He has published more than 150 papers in circuit theory and power electronics, his research intersts being in simulation of power electronics circuits, switched-capacitor-based converters and inverters, soft-switching DC power supplies, and three-level converters.